Last week I turned up to Cult to find a Gospel band playing. Cult were kind enough to reserve some tables for us but it was too noisy for board gaming so we opted to go somewhere else. We tried Isaacs but it was pretty busy that night so ventured on to The Thomas Wolsey. Again, it was pretty busy but we didn't want to turn the night into an impromptu pub crawl so we made do and settled there for the night. 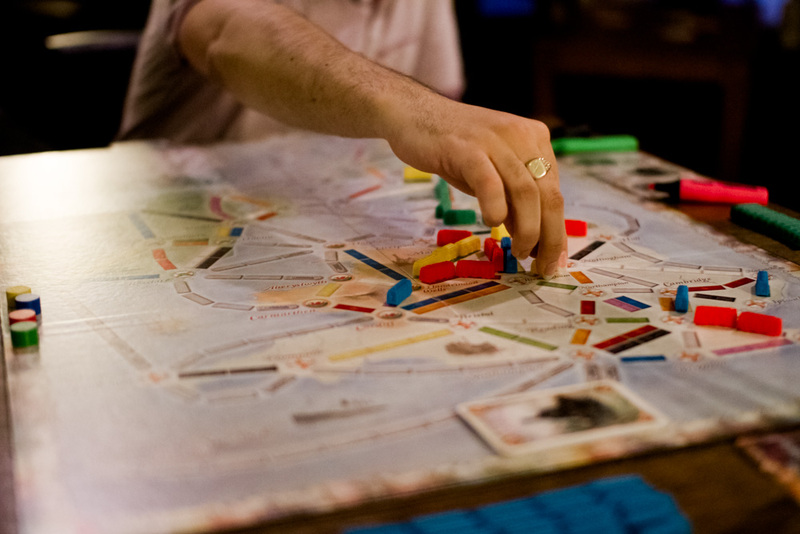 I didn't stay for too long that night but I did manage to fit in a game of the United Kingdom version of Ticket To Ride. I was just ahead on the score track when the game ended and there were just the tickets to score. We revealed the tickets and I was feeling reasonably confident. I had not only completed all my tickets but also completed more tickets than anyone else. However my confidence was misplaced as I came in last. 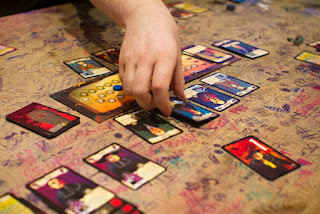 The others played Cosmic Encounter and I'm pretty sure some other games were played in my absence. This week we were back at Cult and things were back to normal. 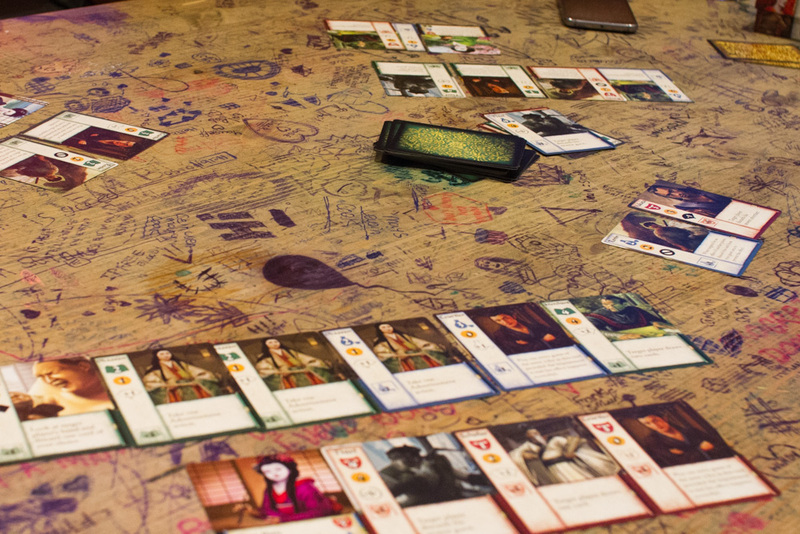 We started off with a couple of games of Red7 and then launched into a game of The Bloody Inn while the others played Codenames. 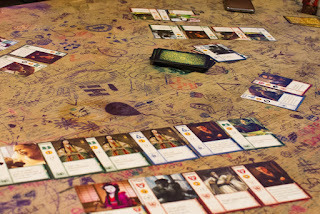 We played the longer version of The Bloody Inn and I got my highest ever score. I think this proves that Priest is an overpowered card. It's probably being removed from my copy of the game from now on. Afterwards we played Mai-Star, a small card game by Seiji Kanai of Love Letter fame. This was not only the first time Alex had played it at the club but also the first time he had ever played it. The game is played over three rounds. In the first round I did pretty badly. In the second round I took a big risk on scoring one of the high value cards and failed. I was in last place. For the third round I chose to take an even bigger risk, trying to play the highest scoring card in the game. It was going to be all or nothing for me. Somehow I managed to pull it off and a smile even crept across my little face. I think the scores were something like 18, 19, 20 and 45. A pretty crazy card. We finished off with a game and a half of Pandemic: The Cure which is pretty much Pandemic: The Dice Game. The first game didn't go too well. Not only in the sense that we did badly and lost easily but also in the sense that Alex didn't like the game. I feel how well you do on the game is dictated a lot by the characters you use so we cheated a little, hand picked our characters and tried again. We fared better this time but Cult was closing so we had to abandon mid-game. Mike brought along the Reiner Knizia classic Samurai which made its IpBoG debut and Danny ran a game of Chinatown and I think I caught a game of Quaridor being played.